The Charlesworth home sale price per square foot has slipped a little to start 2013, but throughout 2012 Charlesworth was pretty consistently selling at $235 per square foot. 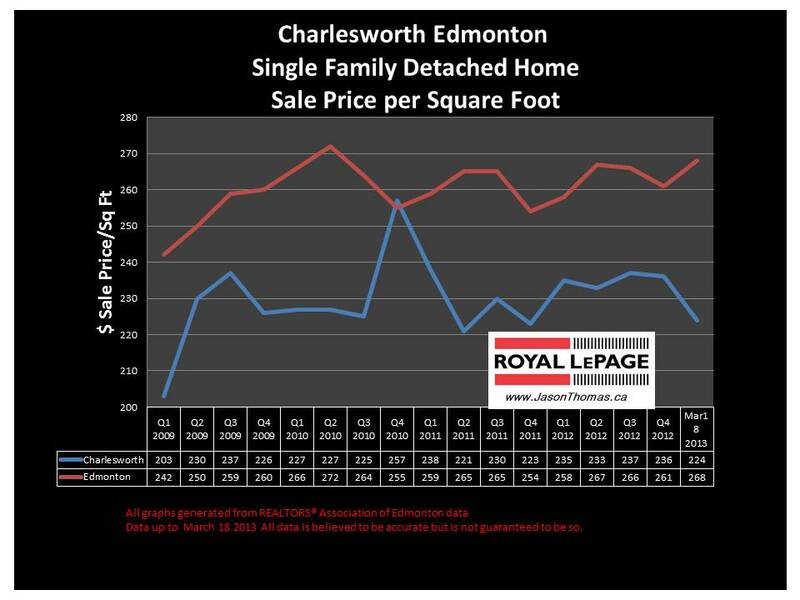 The $230 to $240 per square foot range seems to be a sustainable number for Charlesworth to sell in. The Charlesworth neighbourhood continues to be popular due to it's proximity to Anthony Henday freeway. The highest sale price for a home in Charlesworth in the last 12 months has been $556,000. The most affordable single family detached house in Charlesworth sold for $312,000. The average time to sell a home in Charlesworth has been 52 days in the last 3 months. That is almost identical to the Edmonton average days on market of 51.